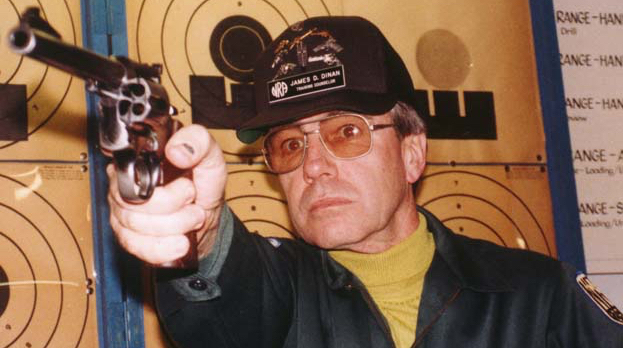 I had been handling/shooting guns for over 30 years before I met Jim Dinan (and was quite satisfied with my skills up till then). But only as a consequence of taking his NRA Certified Instructor's Course for Pistol/Firearm safety/Personal Protection; did I learn how to shoot accurately (and quickly when necessary). The time spent on the range with him (and the class), was like having a personal Olympic coach diagnosing one's weak points and proposing the cure. We were NRA certified instructors for more than a decade in 1985, when curiosity brought us to the James Dinan School. So many of our students had mentioned the school so favorably, we had to find out for ourselves what was going on. After just a few minutes as members of a class, we realized the amazing capabilities of Mr. Dinan. He is to firearms training what the highly successful immersion technique is to foreign language training. "Those who can - Do. Those that can't do - Teach." Does NOT hold true for FIREARM INSTRUCTORS. Dinan is a firm believer in the right to bear firearms but with one condition: No one should utilize this right until he or she has proven their ability to handle a firearm safely and with a reasonable degree of accuracy. His main ambition is to make all American citizens proud of their ability and accomplishments as safe and effective gun handlers by his continued instruction and encouragement. James Dinan School of Advanced Pistol Marksmanship based out of Islip Long Island NY. We offer courses for the beginner to the advanced student. With your Interest, and cooperation I promise to develop you to be part of the 80% of my schools graduates who are capable of outshooting at least 95% of all law enforcement officers and their trainers participating in the same course of fire as the James Dinan School. Bullseye & Combat Classic is a full-day event usually held at the end of each summer. It consists of two distinct forms of shooting competition. The first part consists of standard Bullseye competition and the second part is for 300-point and 600-point combat competition. Each part contributes 900 points to the total 1800 score for the day, which is used for both event trophies and overall placement in the cumulative student rankings. "Speed is Good But Accuracy is Final"
With your interest and cooperation, attendance in one of The Long Island NY James Dinan School of Marksmanship Courses, will develop a student into one of the 80% of graduates who are capable of out-performing 95% of all law enforcement officers & their trainers participating in the same course of fire as that provided by The James Dinan School. The classroom course meets all the requirements of the NRA Basic Pistol and Home Firearm Safety courses except for the range shooting requirements (NRA Basic Training), which can be achieved after classroom instruction by students attending one of the three scheduled range events each year. If you wish, private or semi-private range instruction is also available. Debbie on her 300 combat course shot 289/300 during competition. * Range session also required to obtain full NRA certification. ** Completion of at least the first two sessions of a Dinan School classroom course required as pre-requisite.